The joy of victory and the bitterness of injury – that’s what we, the volunteers, and the spectators see every day. Injury is the downside of Olympic glory – a heartbreaking, but an inescapable part of this great competition, and all athletic competition. Every day here, someone is injured and his or her Olympic dreams are crushed in a split second. While there are a number of doctors on hand to provide medical care, many volunteers are also assisting them. Interpreting and translating, arranging emergency transportation to hospitals, filing incident reports – volunteers do everything possible to help without getting in the doctor’s way. For timely and quality care, you need to create the right conditions, and this lies squarely on the shoulders of the volunteers. Unfortunately, there’s plenty of work for this coordinated team. Events held indoors, in the arenas of the Coastal Cluster, are less traumatic and most of the injuries there are typically bruises and sprains. 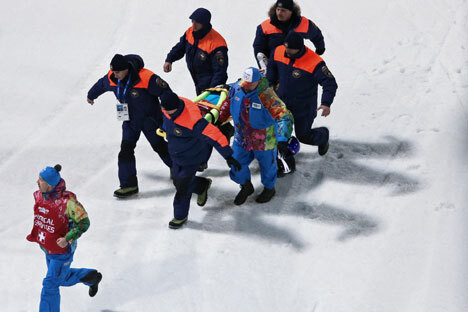 However, in the mountains the situation is much more complicated, and serious injuries that endanger the athlete’s continued participation in the Games are common. Most incidents that require medical intervention happen in training, or in events like alpine skiing, freestyle skiing, snowboarding and ski jumping. Volunteers who work in these disciplines say that after a few days you start to get used to it. My attempts to remain unmoved fail. As the stadium holds its collective breath and a ringing silence hangs in the air, it’s impossible to stay calm. Nonetheless, you have to gather your strength and soldier on even as you desperately hope that nothing serious has happened. Even athletes for whom injury is routine are not unmoved by accidents. It hurts to see an athlete who has himself just recovered from a serious injury turn sharply and stop, wide-eyed, when he hears the sound of a fall. It’s generally very easy to distinguish the sound of a fall from any other – a muffled thump, not loud but at the same time deafening. On television it’s not audible, but in real life it’s the harbinger of doom. Doctors working frantically, people running here and there, phones ringing, somebody screaming. These are the sounds when it all begins.